It’s a common stereotype around the world that US citizens are fat and unhealthy — and that has a lot to do with our diets. Many countries have banned some of our most popular foods, from certain ingredients in your McDonald’s hamburger to your Kraft Mac n’ Cheese. Books like Mira Calton’s Rich Food, Poor Food and other sources have spread information on what foods have been deemed unsafe by foreign governments — and why. Recently, a list of some of the top 10 forbidden ingredients has been floating around the Internet. 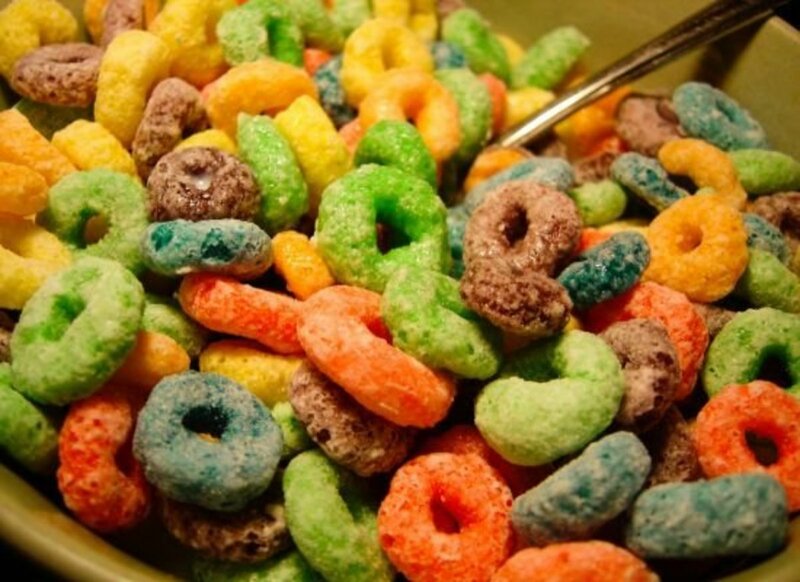 Artificially colored food such as Yellow 5, Red 40 and six other dyes are known as the “rainbow of risk” by the Center for Science in the Public Interest. These dyes, made from petroleum and coal tar, help enhance foods such as Fruit Loops and granola bars. They’re banned in Norway, Finland, France, Austria and the U.K.
Chicken with arsenic is banned in the European Union. Arsenic in used in chicken feed to reduce parasites, making chickens grow faster and giving their meat more color. Of course, it also gives the chicken we eat arsenic, which is known to cause lung, bladder and skin cancers. Drinks with brominated vegetable oil (BVO) are banned in more than 100 countries. You can find bromine in PepsiCo’s Mountain Dew and carpets, where it is meant to be a flame retardent. Breads with potassium bromateusebromated flour, which assists in breads’ rising efficiency, has been banned in Europe, Canada and China — even California declared it a carcinogen in 1991. Potassium bromate has been linked to thyroid and kidney cancers. Frozen dinners with azodicarbonamide, a chemical that bleaches and stabilizes flour, is banned in Australia, the U.K. and most European countries. It’s found in frozen TV dinners, packaged baked goods and some breads, and in foamed items such as sneakers and yoga mats. It’s been associated with asthma. Food preserved with BHA and BHT is banned in the U.K., Japan and many European countries, while the debate over their safety is ongoing in the US. These preservatives are added to cereal, nut mixes, gum, butter, meat and dehydrated potatoes to keep them from turning rancid. Milk with rBGH and rBST, also known as bovine growth hormones have been linked to cancer and infertility. They have therefore been banned in Australia, New Zealand, Canada, Japan and the European Union. These synthetic hormones are given to cows and found in milk and other dairy products. Finally, chips with Olestra or Olean, a fat substitute used in fat-free chips like Ruffles Wow, can produce cramps and leaky bowels. These ingredients are banned in the U.K. and Canada. This list is certainly not all-inclusive and the consequences of what they may cause are overwhelming. While we rely heavily on the FDA to protect us from proven dangerous foods, we can’t forget to pay attention to the foods we eat and the ingredients they contain. One of the most popular materials in our lives is also filled with dangerous chemicals that leak out into our environment: plastic. This isn’t exactly new information, particularly with celebrities like Oprah Winfrey hailing the horrors of bottled water or more and more cities banning plastic bags from being given away at stores. Even Plato’s Closet in Christiansburg will give an extra discount stamp for declining a plastic bag. The waste produced from plastic that isn’t or can’t be recycled takes up a sizable chunk of landfills, simply buried underground with the rest of our waste and allowed to poison that ground. While chemicals leaking from plastic into our soil and water is its own problem, the chemicals that leak into our food and so forth is also consumed by humans. The Food and Drug Administration says that amount that’s actually consumed by humans is safe; however, this only means that it probably won’t permanently harm or kill us. Chemicals from plastic can potentially alter hormones, poison wildlife, and so forth. However, the fact remains that most of our lives are supported by plastic. Your phone, car, grocery containers, and even the IV bag you get at the hospital are all made from plastic. For a relatively new material, it seems to be integral to our world. So how do we stop plastic from killing it? Scientists have been trying to figure that out for years and a team of researchers from North Dakota State University have made a huge step recently. They’ve invented a new recipe of molecules that allows plastic to degrade in just three hours of direct sunlight. The new solution is based on fructose molecules and light-absorbing molecules called phototriggers that when strung together and cooled create a solid plastic. The best part? According to the team’s recently published paper in Angewandte Chemie, these molecules can then be recovered and re-used to make new plastic, which helps reduce the demand for raw materials. Of course the whole dissolving in sunlight thing might not be ideal for many of our plastic items, such as cars or patio furniture. For cell phones and other devices which aren’t often in sunlight for prolonged amounts of time and are difficult to recycle, this material could make a huge impact on waste. While still being tested and modified for commercial production, this new material could be the first leap in a world desperately in need of less plastic. Like all fast food restaurants, McDonald’s promises quality food at an affordable price. Sometimes, however, I wonder if that reasonable price should come with a disclaimer. The quality and standards of the end product should never be compromised because a company is trying to reduce costs; a factor which is being compromised more frequently in the fast food industry. Recently, McDonald’s made a press release stating that their burgers would no longer contain “pink slime.” Pink slime is comprised mostly of ammonia and meat trimmings, according toJulie Kennel, director of Human Nutrition at Ohio State University. Ammonia is a chemical, most commonly found in household cleaners such as Windex, Mr. Clean and Pledge. If inhaled or ingested, ammonia can have potentially serious health risks including fatigue, respiratory failure, burns or corrosive bodily damage. Why would McDonald’s have had an ammonia-based meat product in their burgers in the first place? How do we, as consumers, know what else might be lurking inside one of these burgers? McDonald’s is supposed to be a place we all know and love. Its whimsical past, including Ronald McDonald, Grimace, Mayor McCheese, Hamburglar and many others, bring back memories of colorful ball pits and happy meals. Most of us grew up loving McDonald’s and the entire “eating experience” that has been provided by the golden arches for years. When you think of McDonald’s as a brand, you probably think of the long tradition of beloved food, iconic symbols and lovable mascots. Releasing such a bold statement, such as the removal of pink slime (seeing how most people had no idea that something so dreadful could be hiding inside of their burgers in the first place), could hurt their reputation as a hallmark company forever. The American public should demand better quality food. In discussing what should be done to make sure no harmful chemicals or toxins are in our fast food products, I came to the conclusion that the FDA or another federally funded program should be more heavily involved in the regulation of fast food. After seeing the various articles on pink slime, would that actually entice you to go out of your way to eat at a fast food joint? McDonald’s will, and should, get heat from consumers for an extensive amount of time to come, so hopefully some good will come of this. If the FDA mandates a higher standard for beef in fast food restaurants, then maybe we will decide that it’s safe to eat at our favorite childhood eatery again. High quality fast food matters to me. How about you?